It is often been pointed out that the common designation of The Acts of the Apostles is a bit of an overstatement. Primarily the book of Acts is the story of some of the acts of the apostles Peter and Paul. Luke seems to be telling us that Paul is every bit as genuine an apostle as Peter. Peter can heal a man lame from his mother’s womb (Acts 3:2). So can Paul (Acts 14:8-10). When the Lystrans saw the healing of the lame man they began to call Barnabas, Zeus, and Paul, Hermes. Luke’s account says that the priest of Zeus prepared to offer sacrifices with the crowds. The photo below provides a good illustration of what happened at Lystra. It is an architectural relief fragment showing preparation for a sacrifice. The large marble fragment belongs to the early part of the second century. It comes from Rome, but is now displayed in the Louvre. The bull is being brought for sacrifice. It is thought that this represents only part of the original scene. A panel to the right should show the priest and the altar. Perhaps the laurel wreaths worn by the two characters on the left indicates the departure or return of the Roman emperor. 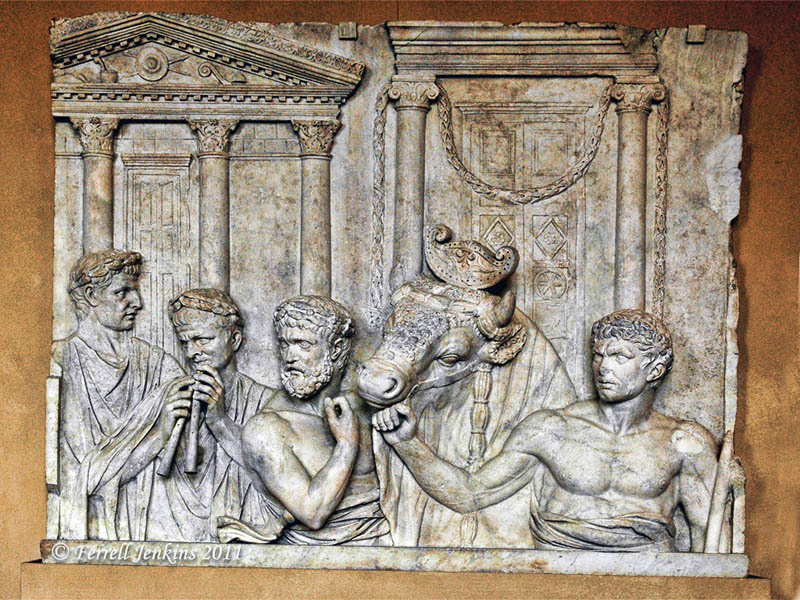 Roman relief shows preparation for sacrifice. Louvre. Photo by Ferrell Jenkins. The motif on this altar is common in the Greco-Roman world. 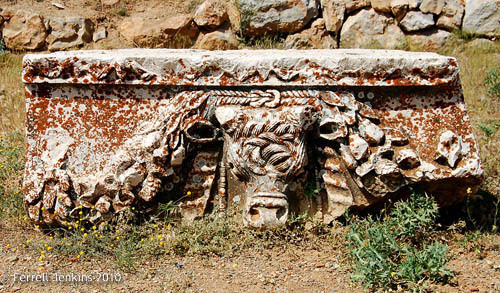 The photo below shows a similar bull’s head on what appears to be part of an architectural frieze in the Augustan Imperial Sanctuary at Pisidian Antioch. Frieze from the Augustan Imperial sanctuary at Pisidian Antioch. Photo by F. Jenkins. This entry was posted in Bible Places, Bible Study, New Testament, Photography, Travel, Turkey and tagged Apostle Paul, Apostle Peter. Bookmark the permalink.